We have a wonderful group of speakers and guests sharing with us this year at TypeParis. We wanted to find out a little more about each of them, so came up with a series of questions which they have generously taken the time to answer. Meanwhile, you should register to his talk on Wednesday 13 July 2016 in Paris. 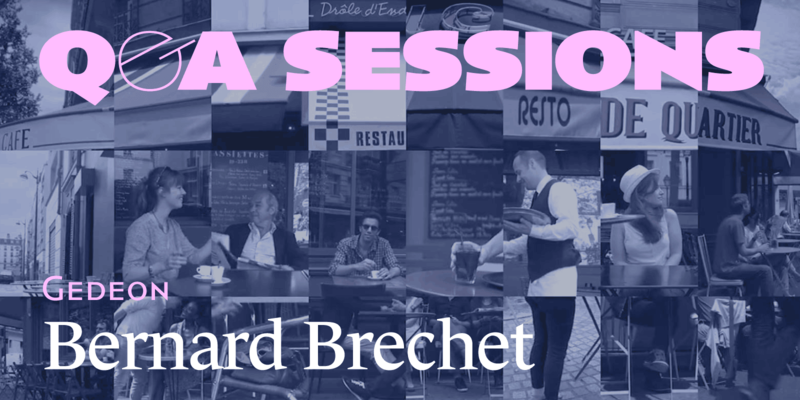 This week we chatted to Bernard Bréchet. Originally from the west of France, Bernard lives in Paris, and is partner at Gédéon, a brand identity, broadcast design and brand content agency. He has worked on projects like France Television’s global identity, as well as many other large scale projects. He is inspired by simple ideas and simple solutions. Bernard Bréchet: Letters and numbers were almost the first drawings I was interested in as a child. I used to draw numbers especially, without knowing that it was actually a ‘field’, or even better, a career. I think typography is in a strict sense, a way to give shape to the language. And there are two notions, shape and language, that I’m really fascinated about. A letter is both. A word is a world. Canal + / Trailer of the new Season from gedeon on Vimeo. OCS Idents Bab from gedeon on Vimeo. OCS – 360° PACKAGING from gedeon on Vimeo. I feel that the internet is maybe bigger for humanity than the creation of the printing process with Gutenberg. I don’t know. Maybe the twenties, because it was just after the biggest mistake ever (WWI) and people wanted a change. They created so much, in all disciplines, in such a short time. I also like the seventies. Otherwise, the Quattrocento, for the same reasons. France 3 – on the Road Again from gedeon on Vimeo. France 4 – Create Your own ad Break ! from gedeon on Vimeo. My favorite movie is “The Deer Hunter » from Michael Cimino, who just passed away. Probably because all that I like/love in life is there: friendship, love, brotherhood, courage, failure, community, rituals, small and big history… It’s crazy that this genius, Cimino, was sacrified that much. But human beings seem to love hate. I love fate. Beauty. I remember entering a small private garden when I was maybe 5 or 6. I gazed at the old wrought-iron chairs and table that fitted so well the trees and the flowers. I got what design was. Beauty, balance, function. Music is probably the second major influence. Bach, Mozart, Beethoven, Schubert, Shostakovich… Jazz and Soul, of course. ¡Neox! – Fresco y Atrevido from gedeon on Vimeo. My 8 month old son, Stelio. Otherwise, France Televisions global identity in 2002. It was a tough pitch, and Gedeon had to win to survive at the time. We won, with a great simple idea. A logo based on screens in motion, that we stopped to create the still sign. And recently, France 4 global package. Again, a simple answer to a complex brief. Music. Nature. Movies. And animals.